Dave and Marilyn Sabold sell a great massage/skincream product that contains all natural ingredients. the North Cascades National Park. Many people have passed through, picked up a jar or two in a local store or directly from us and then contacted us later for more. Here’s what some fans have to say: Testimonials. They ask for more because the great moisturizing effect the skincream has on dry skin from ones hands, face, legs and back. The cream also prevents windburn, chapped lips and cracked fingers. Gardeners love it! More and more body workers have placed orders in the last few years. See: Massage. Anyone doing summer or winter outdoor sports or labor needs a jar in a pocket or nearby, ready to use. in the cream has antiseptic properties that are healing for all chapping, abrasions and baby bottoms. Dave and Marilyn invite you to try and enjoy this all-around skin treat! 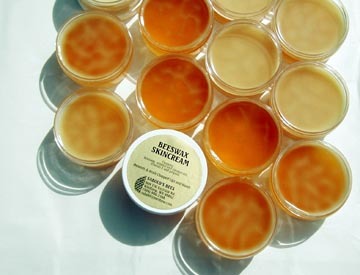 Beeswax Skincream is made using all natural ingredients: beeswax, almond & coconut oils, vitamin E, & propolis. * Propolis is a resinous substance collected by worker honey bees from the leaf buds of cottonwood trees. The bees pack the propolis on their hind legs, and carry it back to their colony, where it is used by worker or "hive" bees as a sealant and sterilant in the colony nest. The antibacterial and antifungal effects of propolis protect the colony against disease.